A larger inflorescence of Pholisma sonorae, showing the somewhat irregular shape. Pholisma sonorae grows in sand dunes of northwestern Sonora, Mexico ("El Gran Desierto") and adjacent California and Mexico. 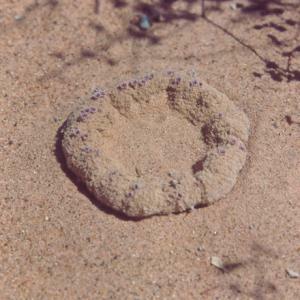 The name "sand food" derives from its apparent use by Sonoran natives as a source of food. Return to the Pholisma sonorae page or the Parasitic Plant Index.